Small cars are a craft and not an art. 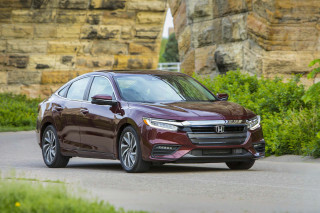 The two cars are among the most prolific models on sale today and despite the growing popularity of crossovers, the Honda Civic and Toyota Corolla are purchased by hundreds of thousands of buyers every year. 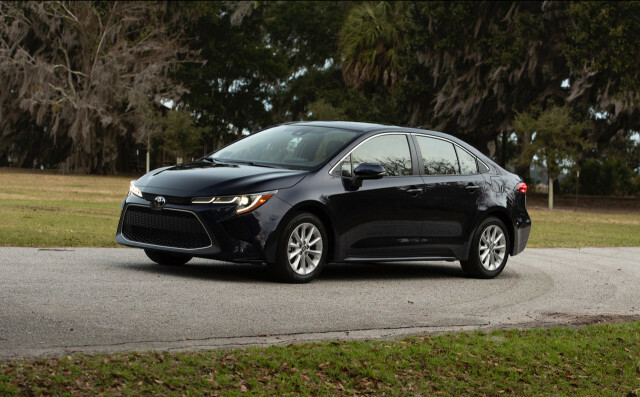 This year, the Corolla is new and includes hybrid and hatchback models that are more frugal or more versatile than before. The Civic has matured into a roster of compact cars that includes hatchbacks, coupes, and high-performance editions. 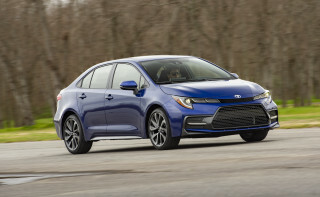 We rate the new 2020 Toyota Corolla at 6.2 on our overall scale, which bends toward the more popular base sedan compared to the other body styles and powertrains. 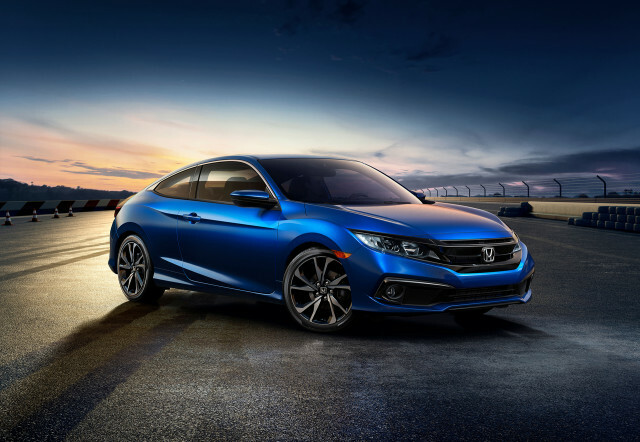 The 2019 Honda Civic rates 6.4 on our overall scale, based on the near-base sedan with a turbocharged engine. Numbers don’t tell the whole story between the two, so we will here. In the style renaissance among new Toyota vehicles, the Corolla used lighter brushstrokes. Although the new sedan is more attractive than the model it replaced, it’s a gradual evolution from last year to this year. The sedan has cleaner lines and a more expressive exterior—we like the hatchback better—but we favored the interiors more. The new Corolla is cleaner and more straightforward. By comparison, the Civic is scattershot—it has to be. With a multitude of body styles, door configurations, and powertrain possibilities, the Civic is busier and looks like it. The sheet metal on the coupe is our pick for the best-looking body, but the sedan is handsome and sharp. Lamentably, the hatchback is the most useful of the Civic bodies but also the most overwrought. Thankfully, the powertrains that are available for both vehicles are easy to consider. That’s because, despite numerous possibilities, most Corolla and Civics will manage respectable fuel economy and performance. The Corolla starts with a 1.8-liter inline-4 that makes 139 horsepower paired to a manual or continuously variable automatic transmission (CVT). It’s just enough performance for the low-cost car and our pick for its compact-car chill. The Corolla SE and XSE offer a 2.0-liter inline-4 that makes 169 hp and a slightly different CVT with a fixed first gear that nets better fuel economy and performance—if you can stand its thrum. A new Corolla Hybrid is the standard-bearer for economical commuting: the EPA rates its inline-4 and battery pack combo at 52 mpg combined. The Civic darts off in the opposite direction. Its high-po 2.0-liter turbo-4 in the Civic Type R makes more than 300 hp and shuttles power to the front tires via a 6-speed manual. The Civic Si is calmer—just 205 hp from its 1.5-liter turbo-4—but still offers fun via a 6-speed manual with a light clutch take-up. Off the performance mantle, the Civic’s 1.5-liter turbo-4 found in most cars is rated at 174 hp and is the compact Honda’s #BestLife. It’s rated at more than 30 mpg in every configuration (up to 36 mpg) and perky. It’s matched most often to a CVT that’s better than competitors’ offerings; if every CVT were as good as Honda’s, “CVT” wouldn’t be a four-letter word in our minds anymore. The 2020 Corolla and 2019 Civic are better equipped to handle four adults and all their gear than prior generations. The Civic’s back seat and Corolla hatchback’s practical cargo area are winners here. The Honda’s front seats are a little behind the Toyota’s, but we’d spend all day in either model. Rear seat riders get more than 36 inches of leg room in the Honda, almost 35 in the Toyota. The cockpit of the Civic seems a little more polished than the Corolla and we’d suggest upgraded cloth in most versions, one step above the base in each model. Crash-safety information isn’t yet available for the Corolla, but the Civic earned top marks by federal and independent testers. The NHTSA gave the Honda five stars overall, and the IIHS gave the Civic top “Good” scores in every crash test. 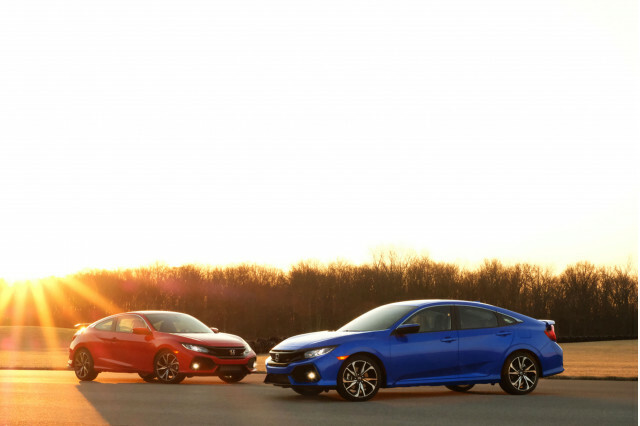 A “Poor” score for the Civic’s headlights kept it from collecting any awards from the IIHS this year. Both Civic and Corolla are equipped as standard with automatic emergency braking and adaptive cruise control. The Corolla goes further: Active lane control is part of its safety suite on every car. Both cars would have modest equipment to meet their low prices, but someone forgot to tell the base Corolla. 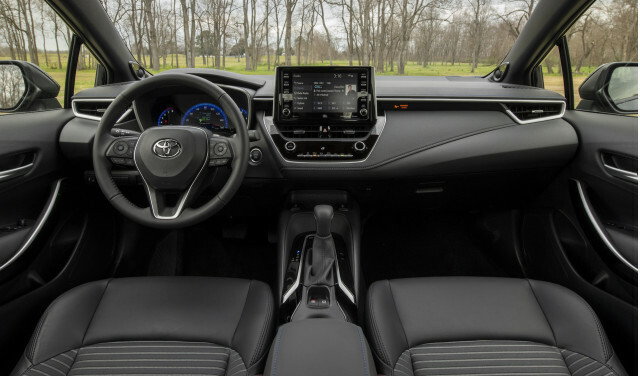 Every Toyota Corolla is equipped with a 7.0-inch touchscreen for infotainment with Apple CarPlay compatibility, LED headlights, 16-inch wheels, and active safety features. The base Civic subs in a 5.0-inch display for audio that’s about three years past its sell-by date. If the price is a consideration, it’s still a coin-flip: the base Corolla L costs $20,430 to start and the base Civic costs $20,345 to start. We’d opt for a Corolla XLE that costs $24,880 and includes a standard sunroof, synthetic leather upholstery, a power-adjustable driver’s seat, and two USB ports. A similarly equipped Civic EX costs $24,295 and includes the uprated engine, a power-adjustable driver’s seat, sunroof, cloth seats, and heated front seats. Both sedans work hard for buyers, we don’t see a bad pick between the two. For now, the 2019 Honda Civic sedan just works a little harder. 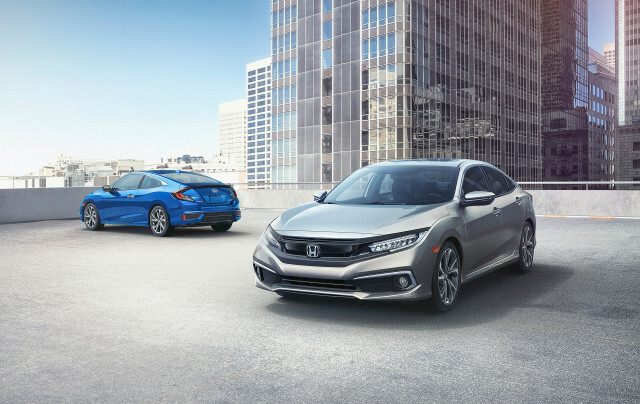 From mild to wild, the 2019 Honda Civic has a look and a bodystyle for everyone. The latest Corolla sips some styling caffeine, but not more than it can handle. The 2019 Honda Civic shines for its balance, even in fire-breathing Type R guise. The 2020 Corolla ratchets up its enthusiasm for driving, but keeps it low-key. The 2019 Honda Civic pairs compact proportions with mid-size space, not to mention an upscale feel. The 2020 Corolla suits up with swell front-seat space; the back seat and trunk pull up shy of rivals. This year’s addition of active safety tech to all models makes the 2019 Honda Civic an even better choice. We’re waiting on Corolla crash-test data to give it a score. The 2019 Honda Civic wants for little and offers a wide range of trims. The 2020 Corolla gets CarPlay and safety galore; it’s a great value, too. Look up frugal in the dictionary and you’ll find the 2019 Honda Civic. 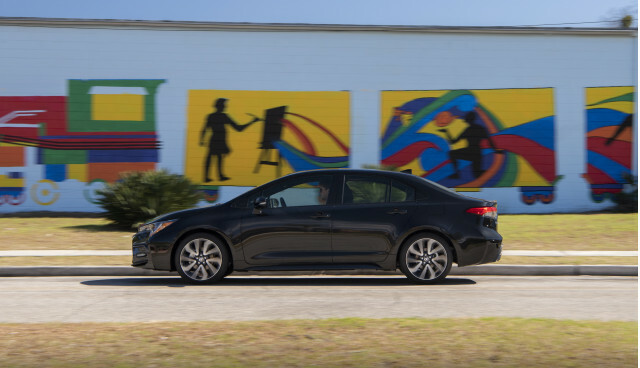 A new hybrid model sends gas mileage soaring; popular Corollas earn good fuel economy. We have sent your request for price quotes on the 2019 Honda Civic and 2020 Toyota Corolla to the dealers you requested. They should be in touch shortly. Your request for a fast, free price quote on a 2019 Honda Civic and 2020 Toyota Corolla is in process. The CarsDirect Dealer(s) listed below will contact you shortly to discuss your request and to provide a quote.